228W Joyetech CUBOID TAP TC MOD W/O BatteryProduct..
Il Kit Include:1 * eVic Basic Battery1 * CUBIS Pro..
Joyetech ATOPACK Dolphin Descriptions: descrizioni..
Il sistema pod Joyop ATOPACK MAGIC è una creazione..
50W Joyetech Atopack Penguin Starter Kit - 2000mAh..
oyetech Atopack Penguin Kit 8ml - 2000mAh 50W ..
Joyetech Atopack Penguin SE Starter Kit - 2000mAhi..
Arriva il nuovo Joyetech Batpack Kit con ECO D16! ..
Joyetech CuAIO D22 Starter Kit - 1500mAhintroduzio..
introduzione al prodottoIl CUBOID Lite è un MOD Va..
Joyetech Cuboid Pro with ProCore Aries Touchscreen..
228W Joyetech CUBOID TAP with ProCore Aries TC Kit..
Joyetech CuBox AIO Starter Kit - 2000mAhProduct In..
Joyetech CuBox è uno starter kit portatile ma pote..
Joyetech CuBox with CUBIS 2 KitProduct Introductio..
eGo AIO Box , essendo tutto-in-uno stile, si .. 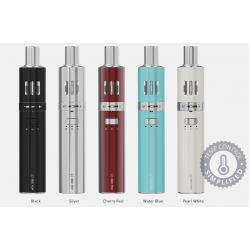 KIT EGO AIO D16eGo AIO D16, being all-in-one style..
eGo AIO D22 eGo AIO D22, essendo all-in-one, at..
eGo AIO D22 XLeGo AIO D22 XL, being all-in-one sty..
La nuova sigaretta elettronica Joyetech&..
Joyetech eGo AIO New Color Version - 1500mAhP..
eGo AIO ProeGo AIO Pro, being all-in-one style, at..
eGo AIO Pro CeGo AIO Pro C, being all-in-one style..
Joyetech eGo AIO ProBox Kit - 2100mAheGo AIO ProBo..
eGo Mega Twist+ KitCUBIS Pro atomizer perfect..
Joyetech eGo ONE TFTA Kit - 2300mAhProduct Introdu..
eGo ONE V2, as the new version o.. Extending to larger battery capa..
80W Joyetech Ekee with Procore Motor TC Kit - 2000..
Il Joyetech Espion ha un aspetto esteriore superco..
Il kit Joyetech ESPION Infinite TC ha un aspetto e..
Joyetech produce sempre innovazioni per gli e-Cigs.. The Joyetech ESPION Solo with ProCore Air Kit..
eVic AIO Being the al..
eVic Primo with UNIMAX 25 AtomizerPowered by dual ..
228W Joyetech eVic Primo 2.0 with ProCore Aries Fu..
228W Joyetech eVic Primo 2.0 with UNIMAX 2 Full Ki..
Joyetech eVic Primo Mini with ProCore Aries Kit W/..
80W Joyetech eVic Primo SE with ProCore SE Kit W/O..
eVic VTC Dual with ULTIMOeVic VTC Dual features th..
Joyetech EXCEED D19 Kit Joyetech EXCEED D19 .. Exceed Edge adotta un design aerodinamico dall'asp..
Ispirato dallo yacht, il Pod Starter Kit Joyetech ..
Arriva il Joyetech Teros AIO Pod Starter Kit! Vien..
Joyetech Unimax 22 Kit - 2200mAh Having..
Joyetech Unimax 25 Kit - 3000mAh Having..